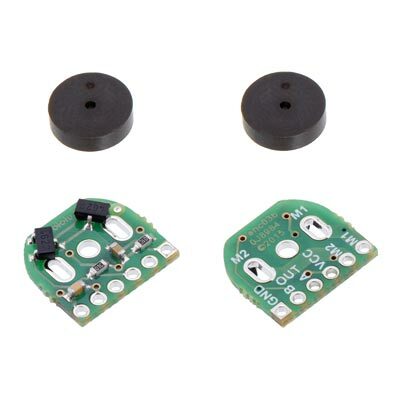 Add quadrature encoders to your 20D mm metal gearmotors (extended back shaft version required) with this kit that uses a magnetic disc and Hall effect sensors to provide 20 counts per revolution of the motor shaft. 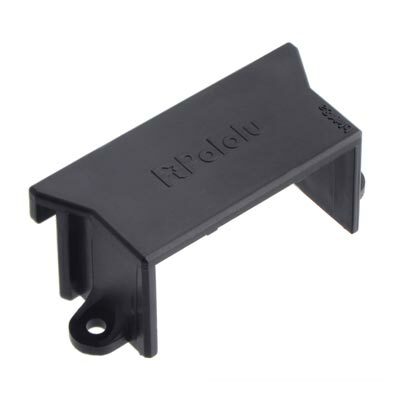 The sensors operate from 2.7 V to 18 V and provide digital outputs that can be connected directly to a microcontroller or other digital circuit. 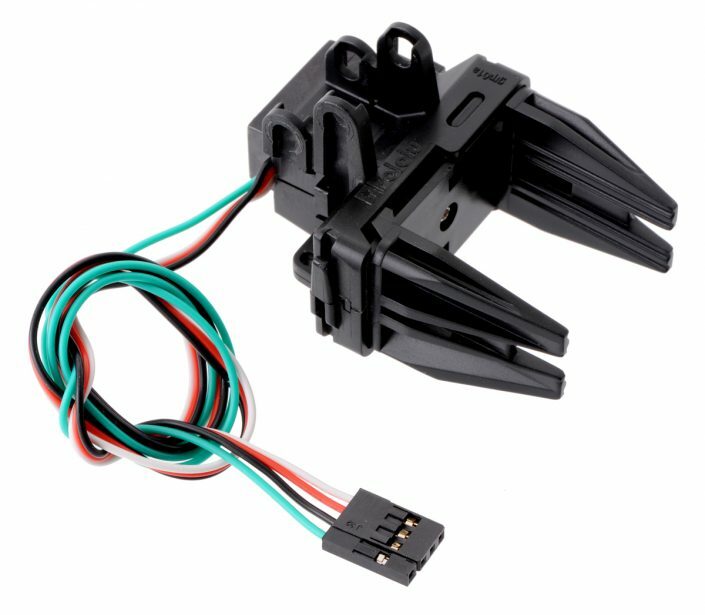 This module is compatible with all of the dual-shaft 20D mm metal gearmotors we carry. 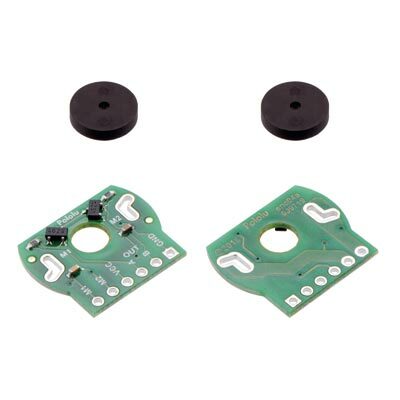 This kit includes two dual-channel Hall effect sensor boards and two 10-pole magnetic discs that can be used to add quadrature encoding to two 20D mm metal gearmotors with extended back shafts (motors are not included with this kit). The encoder board senses the rotation of the magnetic disc and provides a resolution of 20 counts per revolution of the motor shaft when counting both edges of both channels. To compute the counts per revolution of the gearbox output shaft, multiply the gear ratio by 20. 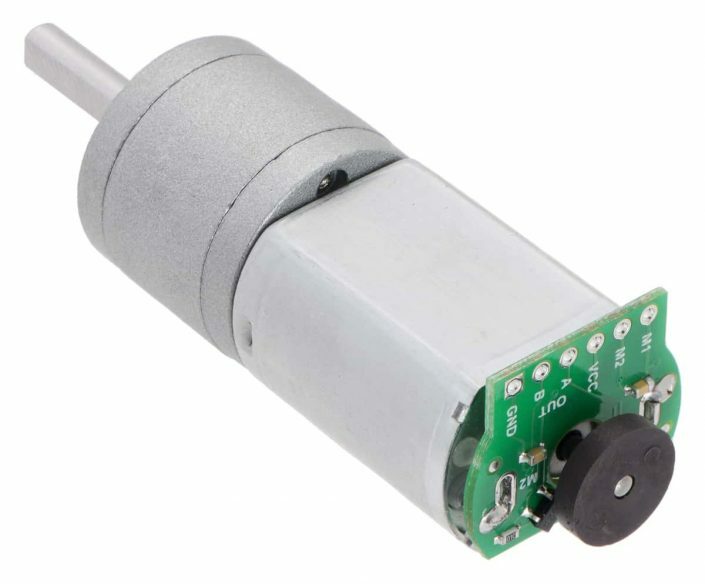 This compact encoder solution fits within the 20 mm diameter cross section of the rear of the motors on three of the four sides. 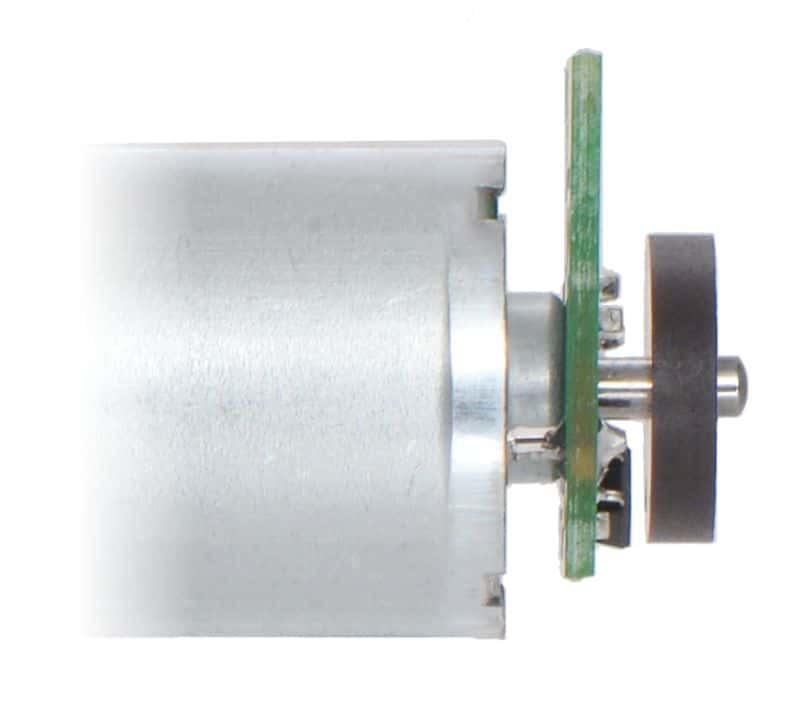 The fourth side of the encoder has the signal and power connections, and it extends 3 mm past flat edge of the motor. The assembly does not extend past the end of the extended motor shaft, which protrudes 6 mm beyond the back of the motor. 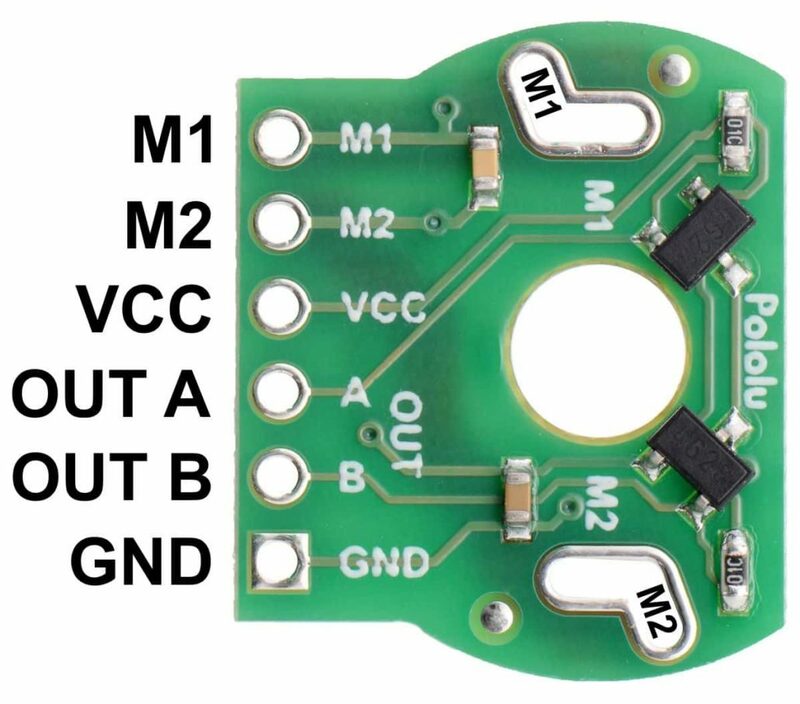 Encoder A and B outputs of a magnetic encoder on a 6V 20D mm metal gearmotor running at 6V. 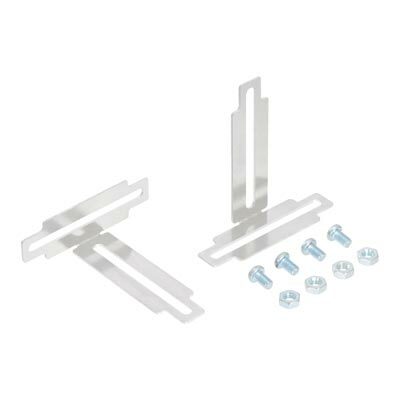 The board’s six pads have a 0.1″ (2.54 mm) pitch, so they are compatible with common 0.1″ connectors, or you can just solder individual wires directly to the board. 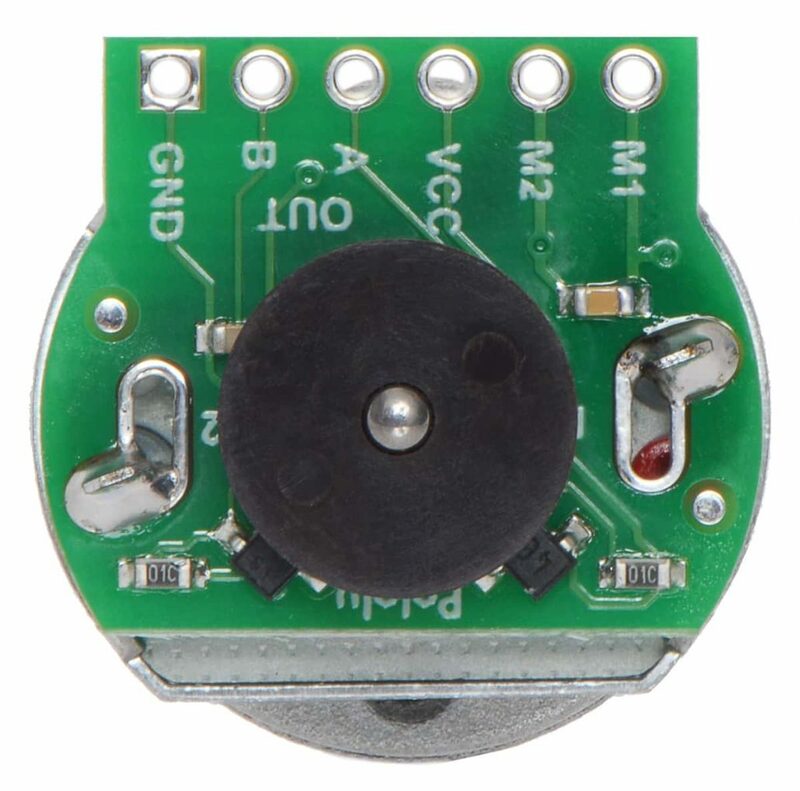 Once the board is soldered to the motor, the magnetic encoder disc can be pushed onto the motor shaft. 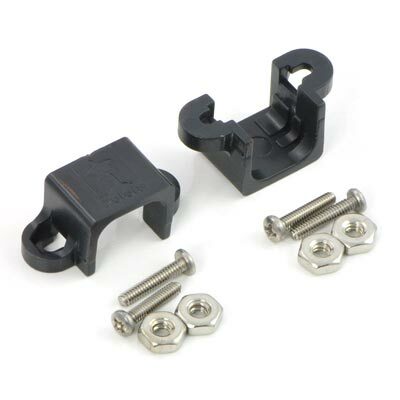 One easy way to accomplish this is to press the motor onto the disc while it is sitting on a flat surface, pushing until the shaft makes contact with that surface. From here, we recommend further pushing the disc a little closer to the PCB (by approximately 1 mm) to help ensure a strong signal and good performance. The exact position doesn’t matter; just make sure not to push it so close that the magnet is rubbing against the sensors.